Green is a great color, one of our favorites, but it doesn’t look so good on your teeth! 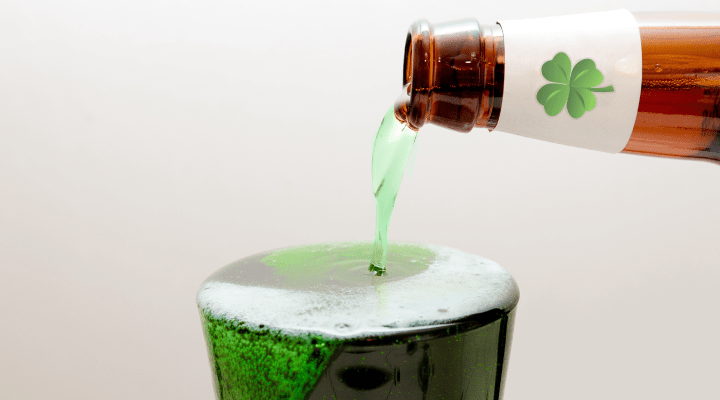 As you get ready to celebrate St. Patrick’s Day, learn how green beer and tooth decay go together, plus ways to celebrate without sacrificing your smile. One significant problem with green beer is the negative effect the dye used to color it has on your health. All color additives for food must be approved by the Food and Drug Administration (FDA). When evaluating the safety of food coloring, they study the short- and long-term effects of consuming and manufacturing it. One study found that all nine of the dyes currently approved in the US come with health risks. Three dyes were found to be contaminated with carcinogens. At least four dyes including colors mixed to make green — Blue 1, Yellow 5 and Yellow 6 — cause “hypersensitivity reactions.” That means they kick your body’s immune response mechanisms into gear. The study recommended that all nine dyes should be removed and replaced by safer alternatives. Beer contains sugar and acids that attack the enamel of your teeth when mixed with your mouth’s bacteria. This leads to tooth decay. Bar crawls are popular around this holiday. Keep in mind that when drinking alcohol for several hours, tooth enamel isn’t able to re-mineralize, or cleanse itself. This also increases your risk for tooth decay. Alcohol dries out your mouth, reducing the amount of saliva to cleanse the teeth. Saliva is important because it washes away harmful debris and bacteria. Heavy drinkers also have a greater risk of developing cancer in the mouth, throat and esophagus. Be sure you’re aware of the risks associated with these activities so you can make the right decision when it comes to green beer and tooth decay. It’s not all bad news and tooth decay, though! There are natural alternatives for keeping the luck flowing and the teeth happy this St. Patrick’s Day. Use 1 tablespoon of wheatgrass juice in the bottom of a beer glass, then add beer on top. Add more juice until the desired color is achieved. Find spirulina at your local health food store in the bulk spices section. You need less than half a teaspoon per beer. Take two handfuls of spinach and put it in a small skillet. Add enough water to cover the spinach and bring it to a boil. Reduce the heat and let the spinach simmer on medium heat for 15 minutes as water reduces. Do not drain. Allow spinach and water to cool before adding to blender. Blend until smooth, about 30 to 45 seconds. Everbody seems to think about what alchohol can do to your vital organs, they never really consider the damage that can be done to your teeth through all the sugars and starches that are in various drinks and beer so definately one to watch out for.